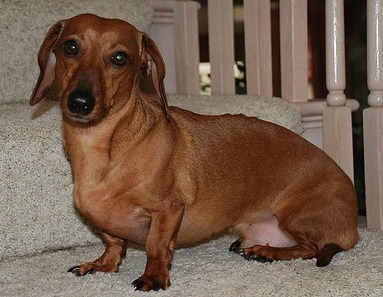 The Dachshund - A feisty, comical little companion with personality by the bucketload. Despite their tiny size, these dogs are brave, alert and playful little companions They are great watchdogs but also great for getting cuddles and having fun with. 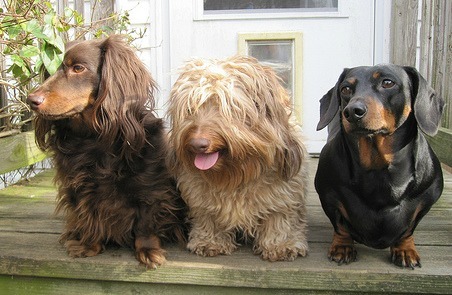 The different coat varieties have very similar personalities although the long haired tends to be slightly more relaxed and laid back and the wire haired a little more clownish and fun. Although they were bred for life in the country, life in the town seems to fit them well also as they are very adaptable. The miniature versions especially can be apartment dogs as long as they can be taken out for walks daily. They can be a little feisty and stubborn so make sure you stand your ground with them otherwise they'll be walking all over you! 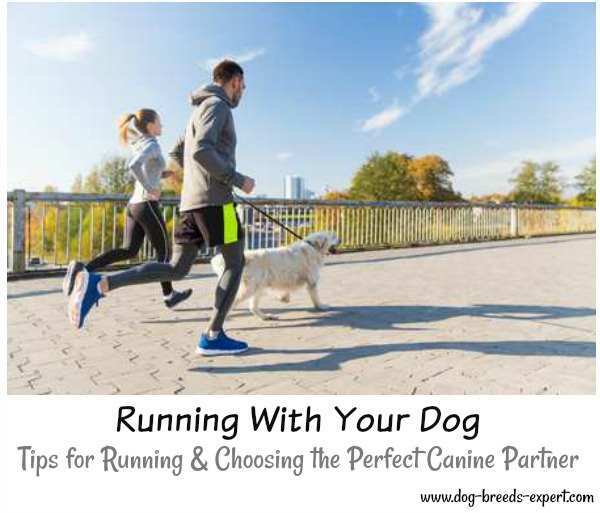 They are friendly to other dogs and love socialising with them however they also have a strong prey drive so need to be taught that any other household pets such as cats or rabbits are not to be chased. These little "Sausage Dogs" get on well with children too although children need to be shown the correct way to lift a dachshund so as not to hurt its back. For this reason, slightly older children are recommended. Jealous or frightened dogs have been known to nip so care is needed not to let children tease or move too quickly around them. 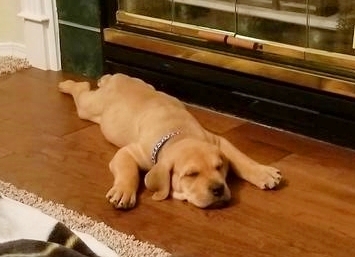 This breed of dog should be discouraged from jumping and from over-exerting themselves as they may well damage their long back in the process. And they love to dig so make sure your back yard is well secure and that they have a nice cosy blanket to burrow into at night. They dislike being left alone for long periods of time and may whine until they get some company. They have even been known to suffer from Separation Anxiety. I love this video of Madeline, a puppy having a great time playing with a crab on the beach. Not sure the crab is having such a good time though! Her little face at the end when the crab scurries off into the sea - she looks so disappointed that her fun is over, poor soul! 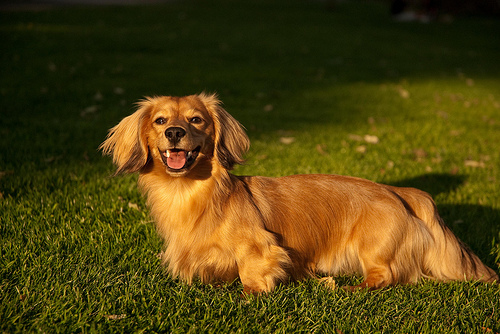 Dachshunds are originally from Germany, and the name literally means "Badger Dog". The Standard variety was bred to hunt and dig out badgers and the miniature variety was used for rabbits, stoats and rodents. They were very popular with Royalty and even got the Royal stamp of approval from Queen Victoria! 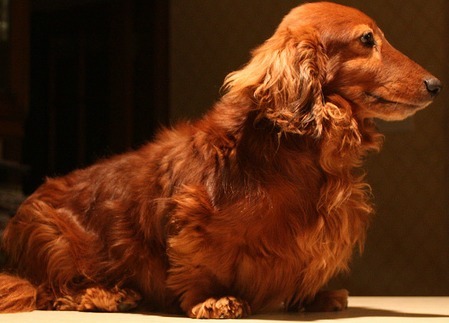 The first of the three varieties was the smooth haired dachshund. From this came the other two varieties. 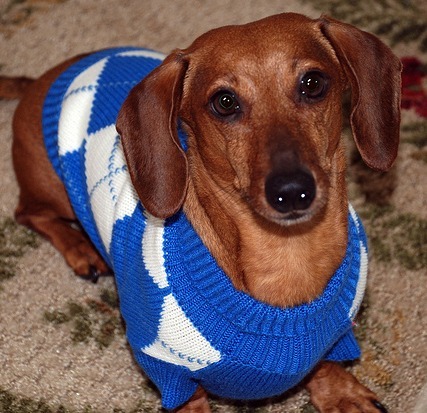 You can find out what life with a Dachshund is really like by reading our interview with Jenny about living with her smooth coated Dachshund, Toby. He has some funny little quirks! Dogs had puppies which had slightly longer hair and these were bred to eventually produce a long haired version of the dog. 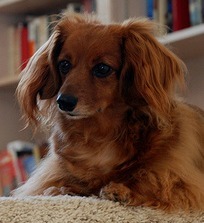 The smooth haired dachshund was crossed with various breeds of spaniels. The wire haired version came about in the late 19th century and is probably the result of a crossing between the smooth coated version and a few wire or hard haired terriers. No longer used for hunting, these little fellows have transited smoothly into the role of a companion dog. Available in Smooth Coat, Wire Coat and Long Haired and all three different coat types are available in miniature versions. 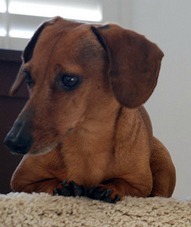 Dachshunds have a reputation of being slightly difficult to house-break. This can be helped with patient training and using positive methods to reward your dog when he gets it right. He's never going to win first prize in formal obedience trials but he can be trained to a perfectly acceptable level provided you are kind, firm and consistent. Don't let him walk all over you! They can be slightly aggressive towards strangers so they need to be properly socialised to nip this in the bud. 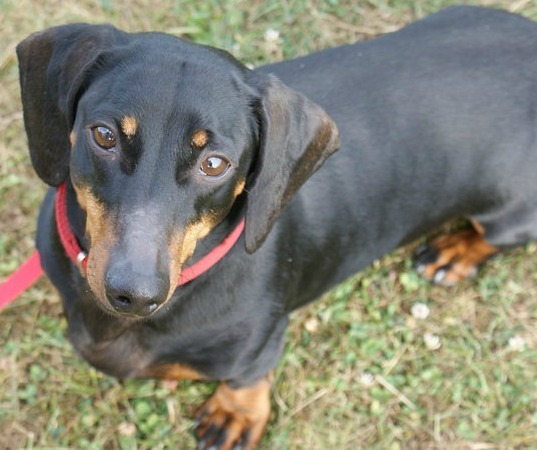 Sausage dogs are excessive barkers who's bark is surprisingly big for their size. Although, the miniature versions can be particularly shrill at times. All versions will alert you to any strangers approaching your property and will more than likely try to take on the intruder as they have no concept of their size. Smooth haired varieties need very little maintenance - a weekly brush to remove dead hairs is all he needs. His longer haired counterpart requires brushing every two or three days to stay on top of any matting, tangling, mud or twigs brought in from the garden. And the wire haired dogs need brushing a few times a week plus hand stripping twice a year to keep their coat looking respectable. For all of the above problems we reccomend aloe vera for dogs, in particular the aloe vera gel that can be mixed with their food and works from the inside out to promote health. There are also products to complement any vet treatment. CLICK HERE to read about these great natural products. 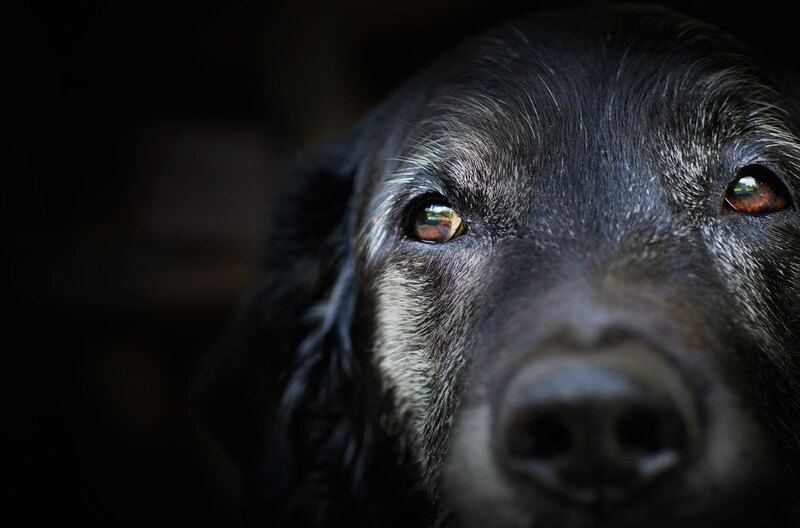 You could find out about other Dog Breeds in the A To Z List with photos or perhaps you'd like to check out the other 10 Most Popular Dog Breeds?